Cash is an estimated 3 year old handsome young black and white male with lots of ticking. He came from Muskogee, OK with Merle and Waylon. They were owner surrenders to the animal shelter there. Cash was positive to Ehrlichia Canis when he arrived. He has completed his treatment for Ehrlichia Canis, and has a negative PCR (polymerase chain reaction) test. This fun boy is ready to find his forever couch! Cash is not considered to be small animal or cat tolerant. Cash has completed his treatment for Ehrlichia Canis, and has completed all his medical procedures. This handsome boy is ready to find his forever home. "Money isn’t everything, but Cash is! He’s everything you’d want in a companion hound. He’s not only a handsome young boy, he’s also smart and fun loving. 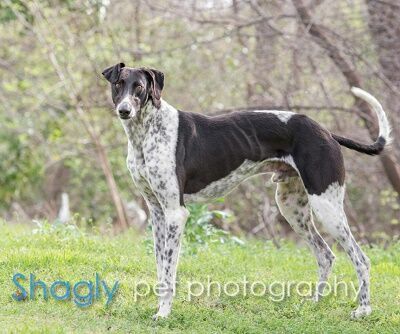 His white and black ticked coat is so short, soft, and shiny PLUS he is actually a low-shed greyhound. Cash enjoys the company of other greyhounds (or large dogs); Cash has a high prey drive and is not small dog or cat safe. 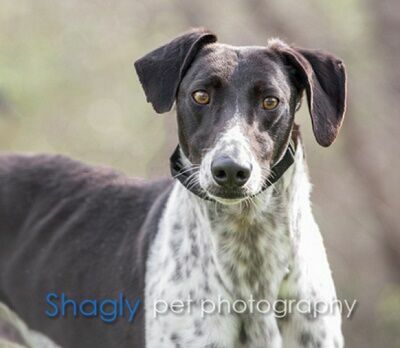 Cash has a beautiful singing voice and will roo along joyfully with his pack mates. Cash loves his dog pack and his people and will melt your heart with the cutest head tilt. He can adapt quickly to new situations and is okay being the non-dominant dog. He loves affection and attention from his humans whenever it’s offered, but isn’t a Velcro-type dog, but is always willing to receive and enjoys special attention. He’s learning some simple commands and could likely be a very well trained boy. He gets along well with well-behaved children and doesn’t interact with them much. Cash is not a dog for crating, as it makes him anxious and is a hazard if he tries to escape (a solid airline crate instead of a standard wire crate can be used if crating is a must). He has free roam of our house when we’re away and is rarely destructive although he does like to move things around (like dog beds, toys, and throw rugs). Cash does not like to be in a room with closed doors, other than that, Cash is a very calm, laid back and chilled out boy for his young age. He walks well on a leash. He loves his food, has not shown any food aggression, and is always willing to clean up what his foster sisters don’t finish. He is a counter surfer, so leave no food unattended. He has had excellent potty habits, but note that he has doggie door access at his fosters’. Cash lives with his foster family in New Mexico and isn’t bothered by our thunderstorms or hot air Balloon Fiesta; he reportedly does not like fireworks or gun shots (who does). Cash is a great dog and his forever family will be as charmed by him as we have been. His ideal home will have other medium to large sized dogs, a yard to run and play in, and a family to adore.